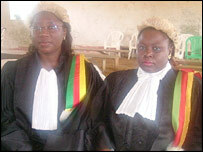 A documentary about women's roles in a Cameroon court co-directed by a south Wales lecturer, has won an award at the Cannes Film Festival. Florence Ayisi, who works at the University of Wales, Newport, said the success of Sisters in Law was "beyond her wildest imagination". Shot over three months, the movie follows a state prosecutor and a judge in a courthouse in the town of Kumba. Ms Ayisi said winning the Prix Art et Essai was "fantastic". The prize was awarded by CICAE (Confederation Internationale de Cinema d'Art et D'Essai), presented since 1992 as part of the director's fortnight at Cannes. Several distributors are now said to be interested in the film. "It feels like what we wanted to do in terms of showing different images of Africa - both in the West and in other African countries - has been realised," said Ms Ayisi, who grew up in Kumba. "My ambition is coming to fruition." There is an audience there for telling different emotional stories. She said the film - co-directed by Kim Longinotto - seemed to be making people think differently about Africa, just as she had hoped. "The film is touching many hearts - I think people see it and they don't see Africa, they see people." The filmmakers followed four court cases involving women and young girls, and explored the work of state prosecutor Vera Ngassa and Beatrice Ntuba, the judge in the magistrate's court. Ms Ayisi attended last week's festival and took Ms Ngassa and Ms Ntuba with her. She said they were "in awe and felt like they were dreaming", especially at the reaction they received. "They were given standing ovations and people were asking for their autographs - they were proud, but shocked and surprised. "They are revolutionary, fighting in a quiet way to make things better for everyone." Ms Ayisi, who is now working on another project in Cardiff, said the Cannes experience had helped her as she carries on filmmaking. "I think it has boosted me a lot, given me more energy, more confidence," she said. "Making Sisters in Law has been a steep learning curve. It has opened my eyes to realities and challenges of filming - it can only help my vision and the voice I want to find. "There is an audience there for telling different emotional stories." 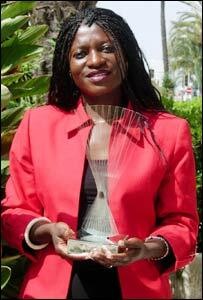 Ms Ayisi is programme leader on the film and video course at the International Film School Wales (IFSW). The movie, filmed between August and November 2004, was first screened on 9 March 2005 in London as part of the Birds Eye View Film festival.